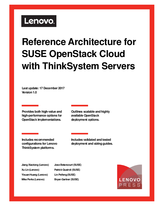 This document describes the Lenovo® reference architecture for SUSE OpenStack Cloud integrated with SUSE Linux Enterprise Server. The intended audience of this document is IT professionals, technical architects, sales engineers, and consultants who assist in planning, designing, and implementing SUSE OpenStack Cloud with Lenovo ThinkSystem products. The solution is targeted to managed service providers (MSPs), cloud service providers (CSPs), and customers who require a highly available, enterprise-quality private Infrastructure as a Service (IaaS) cloud. This reference architecture outlines configurations for Lenovo ThinkSystem in highly available deployment models. Recommendations are provided for scaling Compute or Storage Nodes based on virtualization capacity from low-density to high-density configurations. To view the document click the Download PDF button.